Patrik Lindström Electro-Industrial, Dark Electro When a band mixes EBM with guitars, it usually sounds like some of the stuff made by Front Line Assembly or like rock with some synth mixed in as Zeromancer. Battery Cage does the mix perfectly, EBM with a rock attitude. The most part of the music is heavy EBM with poisonous guitars a la industry. The vocal adds to the rock feeling because the static song associated with EBM music is left aside. 'World Wide Wasteland' is partly a debut album as the first album, Product, due to be released 1998, never really saw the daylight because the record company SINless Records ceased to existed soon before. 'World Wide Wasteland' is a tasteful collection of industrial tracks with choruses that really sticks to your mind. Since I first listened to the record, it hasn't been a day without me humming the great track "Mirror Image Enemy". However, the tracks "Anti Angel", "Wasteland", "Ecstasy" and "Cage" shouldn't be ignored as they are as good as the previously mentioned track. In writing moment, Battery Cage is in the studio recording their third album. I personally would want my hands on that album as soon as possible. When a band mixes EBM with guitars, it usually sounds like some of the stuff made by Front Line Assembly or like rock with some synth mixed in as Zeromancer. 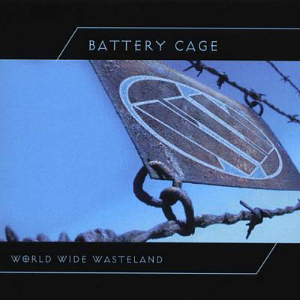 Battery Cage does the mix perfectly, EBM with a rock attitude. The most part of the music is heavy EBM with poisonous guitars a la industry. The vocal adds to the rock feeling because the static song associated with EBM music is left aside.